by Laloganes, John Peter; Schmid, Albert W.A. The fundamental aspects of managing beverages in the exciting hospitality industry. The Beverage Manager’s Guide to Wines, Beers, and Spirits, 4/e, takes readers on an intriguing journey through the vast world of alcoholic beverages. It is an authoritative guide that will inspire those individuals pursuing or enhancing a career in the food and beverage industry. 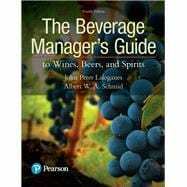 Written in a lively, engaging, intellectually appealing style complimented by stimulating photography, this comprehensive yet concise book explores the essential management and service aspects of wines, beers, and spirits and provides the knowledge necessary for building and sustaining a profitable beverage program. The Fourth Edition includes a new opening chapter on beverage trends, expanded coverage of grape varietals, 22 new classic cocktail recipes, a new chapter on sake and cider, a new chapter on coffee and tea, greater emphasis on beverage and food pairing, and full-color text that depicts the beverages as artistic, unique, and essential to the food service organization. John Peter Laloganes is an award-winning sommelier, author, and educator and has been a contributor to the Hospitality Industry since the mid-1980s, avidly collaborating and strategizing with restaurants and related beverage establishments. He has traveled and tasted extensively throughout the major wine and beer producing regions of Europe and the United States. In 2012, Mr. Laloganes was awarded the "Sommelier/Wine Steward of the Year" by the IACP International Association of Culinary Professionals. Currently, John is the Proprietor of The Wine and Beverage Academy of Chicago (a Chicago-based training and consulting firm); Director of Beverage Management and Assistant Professor at Kendall College in Chicago, IL and the founder of Kendall’s Wine Professional (WP) Program, an accelerated 3-tiered sommelier educational track that is designed for industry professionals and serious beverage enthusiasts. In 2016, John was recognized as the Educator of the Year from Kendall College and was awarded the highest organizational honor as the recipient of the Laureate Global Products and Services (GPS) Award for Innovation for his work in creating the Wine Professional (WP) Program at Kendall College. From 2012 to 2014, John was Wine Director at the Grey Plume restaurant in Omaha, NE., and Sommelier/Management Instructor at the Illinois Institute of Art-Chicago, where he was honored with the Excellence in Teaching Award in 2012. Albert W. A. Schmid is a chef, bartender, sommelier, and award winning author. He is the author of The Kentucky Bourbon Cookbook published by the University Press of Kentucky, winner of the 2010 Gourmand Award for Best Book for Cooking with Wines, Beers and Spirits in the USA and the Best Book for Cooking with Drinks in the World. He is also the author of The Beverage Manager’s Guide to Wines, Beers and Spirits, published by Pearson Education, which won the 2012 Gourmand Award for Best Wine Book for Professionals in the USA and The Hospitality Manager’s Guide to Wines, Beers and Spirits, The Old Fashioned: An Essential Guide to the Original Whiskey Cocktail, and The Manhattan Cocktail: A Modern Guide to the Whiskey Classic. In 2016, Albert joined the faculty at Guildford Technical Community College (GTCC) in Jamestown, NC. Before joining GTCC, he was a member of the faculty at Sullivan University’s National Center for Hospitality Studies where he was the Director of the Hotel-Restaurant Management, Event Management, Beverage Management, and Hospitality Management departments. He was granted the title Professor by the Sullivan University Academic Rank Committee in 2010. In 2011, Albert received an Award of Excellence from the International Association of Culinary Professionals (IACP) as the Wine Steward or Sommelier of the Year and was awarded membership in the Wine Century Club which is reserved for wine connoisseurs who have tasted wines from a minimum of 100 different grape varietals. He is also a Master Knight in the Brotherhood of the Knights of the Vine. Albert holds a BS from Charter Oak State College. He is the 2002 recipient of the International Association of Culinary Professionals’ Le Cordon Bleu/University of Adelaide scholarship for graduate study in Gastronomy, and in 2006 he was awarded a Master of Arts in Gastronomy, with a dissertation titled The History of Beer in Recipes in the United States.